Scores of Mac users are found to face the same frustrating problem that when they aspire to stream their collected VOB files (removed from DVDs) to their preferred Xbox, PS4, ZEN and more portable devices on Mac, they fall in disappointment right away, for VOB files are incompatible with their gadgets. In such case, they seek for help via myriads of ways, among which to convert VOB to WMV on Mac stands out from the crowd. As is known to all, VOB files, abbreviation of DVD Video Object, are a container used for storing video, audio and subtitle streams, which are favorable for saving DVD movies. They are encoded with MPEG-2 codec and desperately large in file size, which can't be supported by Xbox, PS4, ZEN due to their different video codec and limited storage space. Yet, WMV, widely-used in video game gadgets, is a compressed video file format developed by Microsoft to seamlessly work with an array of stylish devices coupled with its incomparably small file size yet astounding high quality. Now you may get why the majority are enamoured of converting VOB to WMV on Mac. Top video processing app to convert VOB to WMV and meanwhile compress VOB files to WMV with much smaller file size for easier playback on media device. Well, you are probably wondering what program can efficiently convert VOB to WMV on Mac. 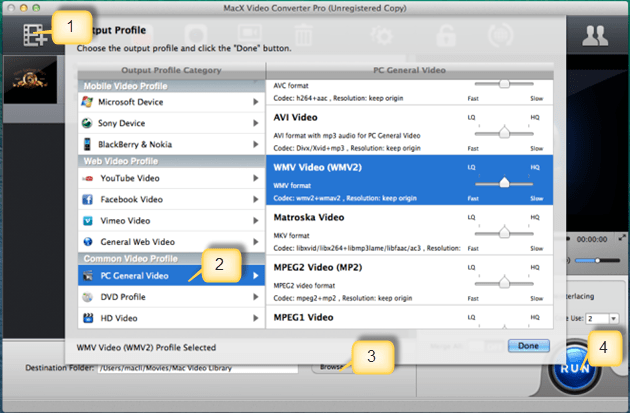 Here, MacX Video Converter Pro is worth your consideration as it's especially designed to render you a decent solution to fast compress VOB and decode VOB format to WMV on Mac without compromising a wee bit quality. In addition, it's also praised as powerful "Swiss army knife" that it can handle both HD videos and SD videos like VOB to MP4, VOB to AVI, WMV to MOV, AVCHD to MP4, MKV to AVI, etc, but also it's competent to change VOB to a wide selection of mobile devices like VOB to iPhone Xs/X/8/7/6S/Plus, iPad mini 4/Air 2, iPad Pro, Apple TV 4, iTunes, Samsung, HTC, Xbox, PS4, Kindle Fire and more with 420+ preset profiles available to choose. Step 1: Load VOB Files. 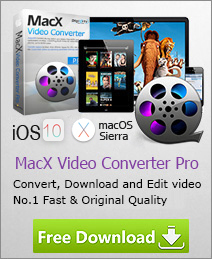 free download this Mac VOB video transcoder and launch it, click "Add File" button and locate the VOB files. Step 2: Choose "to WMV" as the Output Format. Choose WMV as output format from the format list. After this, you are also allowed to adjust a rich set of parameters like Bit rate, frame rate, resolution and so on to further reduce the file size of VOB video. Specify output folder on your computer to save the output files. Click the "Browse" button to select a folder where you want to place your output WMV files. Step 4: Start VOB to WMV Video Conversion. Press the "RUN" button to start converting VOB to WMV on Mac OS, you could view the conversion progress and are able to cancel the process at anytime. Tips: Aside from powerful enough to transcode a VOB to WMV on Mac, it's also a marvelous tool to download and convert online videos from YouTube, Facebook, Vimeo, Dailymotion, Vevo, Myspace, Soundcloud, etc. 1000+ video music sharing sites to a truckload of formats regardless of HD videos (AVCHD, TS, MTS, MKV) or SD videos (MOV, MP4, AVI, MKV, FLV, 3GP). Plus, it can ensure you a superfast VOB to WMV conversion while retaining original high quality attributing to the aids of Intel/Nvidia/AMD GPU HW acceleration tech, multi-core CPU and High Quality Engine.